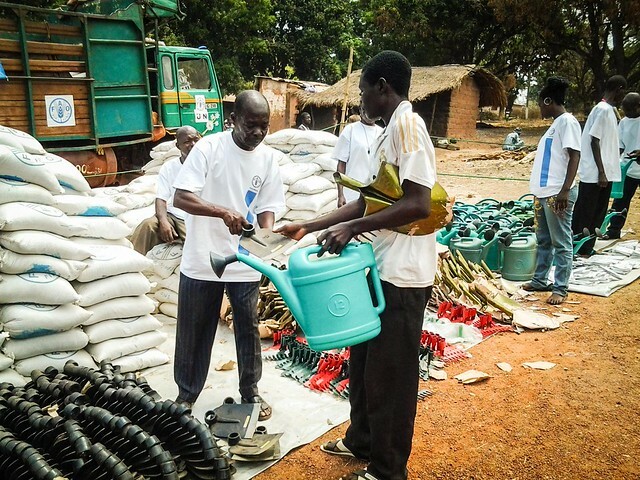 A major operation to distribute seeds and tools has been launched in the Central African Republic to support crisis-hit farming families. This is the largest ever intervention in the country led by the UN Food and Agriculture Organization (FAO) and its humanitarian partners. Some 16 international and national non-governmental organizations are working with FAO to overcome the challenges of inaccessible roads and a deteriorating security situation to ensure that farmers receive agricultural kits in time for the next planting season. A total of 1 800 tonnes of staple crop seeds, as well as hand tools, will be distributed by the end of May to 75 700 vulnerable families - or 378 500 people - in 15 prefectures across the conflict-stricken nation. Distribution started at the end of April, and within a few days 11 660 farming families had already received kits. Each family is receiving 25 kg of seeds and two hoes so that they can produce at least 500 kg of groundnuts, maize and rice to contribute to feeding them for around four months. The country’s agricultural sector has been severely disrupted by ongoing fighting since December 2012, which has led to chronic countrywide malnutrition, extreme poverty and inappropriate sanitation. Some 1.6 million people are in urgent need of food, while one in five has fled their homes in fear of violence. “The delivery of these agricultural kits is of critical importance since they will help avert a full-scale food and nutrition crisis in the country,” said acting FAO Representative Alexis Bonte. As of 15 May, FAO had already positioned nearly 90 percent of the seeds and tools required for the operation at local hubs from where partner NGOs collect the kits and transport them to distribution sites in rural areas. The remaining 10 percent of seeds are due to arrive at the hubs by next week. The Organization is coordinating delivery with the World Food Programme to ensure that kits are provided together with emergency food rations to reduce the risk that desperate families will eat the seeds instead of planting them. “This partnership is particularly important since the hunger season - when food from the last harvest runs out - came early this year, starting in February instead of July,” Bonte said. In addition to the distribution of agricultural kits, FAO is working to revitalize the agricultural sector and increase farmers’ ability to cope with crisis as part of longer-term support to the country. Following a joint mission in April, FAO and WFP warned that the Central African Republic needed an extensive humanitarian operation over at least the next 18 months to help rebuild livelihoods and increase resilience. Crucial activities FAO plans to carry out by the end of the year include supporting affected populations and women’s groups to generate income and restore food security through cash-for-work activities and small livestock and short‐cycle vegetable production. To revitalize local markets, FAO will also promote the production of seed, some of which it will then buy and sell on local markets through seed fairs organized by NGOs. In addition, the Organization will help integrate savings and loans schemes for women’s associations and improve management for small-scale agro-processing, food production and post-harvest handling. To date, FAO has received more than $30 million for its operations in the Central African Republic, of which $14 million are allocated to providing agricultural kits to vulnerable households. However, an additional $17.5 million are still required to provide livelihood support to the population this year that will allow them to generate income before the harvest, purchase food from the market, and diversify their activities for year-round earnings.